Full Carbonised Bamboo Face with Full Brown Leather Strap– Unisex. Pick up a sleek look with this st..
Sleek timepiece from Ebony wood and a black Leather strap. Dark and sleek, this watch will happily a.. This sleek timepiece - Unisex from Zebra wood is perfect for those weekends away in the bush or back.. This sleek timepiece for men from Maple and Sandalwood to meet your week to weekend needs. Its a cla.. 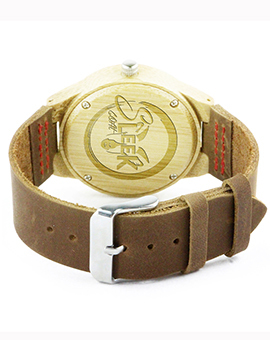 This sleek Unisex timepiece with a Natural Bamboo face and Walnut Wood Dial, and full Brown Leather .. This sleek timepiece - Unisex from Zebra wood, oozing understated style and sophistication, this tim..
Add an elegant touch to your look with this sleek timepiece. It’s designed with a Walnut wood casing..
Walnut Face with Ebony Wood Dial with a full Brown Leather Strap - Unisex. This sleek everyday timep..